Ten years after construction began with the dredging of the Potomac River, the $2.5 billion Woodrow Wilson Bridge improvement project opened to motorists Monday morning in what has been one of the most congested commuting corridors in the country. "We had backups of three, four, five miles on a regular basis. It's a soul-killing experience to be sitting there day after day," project spokesman John Undeland said. 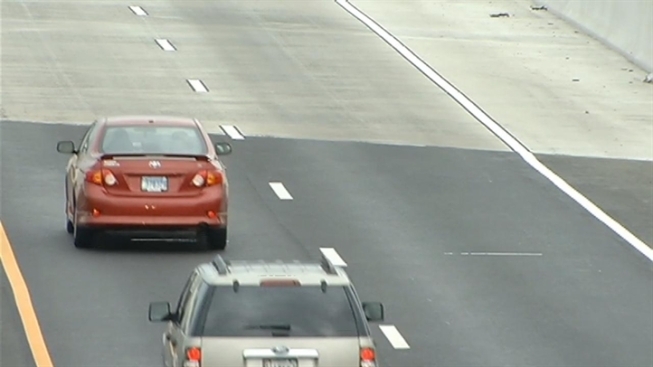 With lane closures and detours now history, five lanes in each direction were opened on the I-495 Capital Beltway from the Telegraph Road interchange across the Wilson Bridge into Maryland. The bridge, improved with two new spans, is also five lanes each way, ending what had been a terrible bottleneck. The bridge used to have only three lanes in each direction. "The Beltway is Washington's main street. This is how we get around, and this had been a constriction for more than a decade," Undeland said. Transit and environmental advocates say the improvements are lacking. Once promising plans to use the bridge's two center lanes for rail transit never came to fruition, despite investments to stabilize the bridge to handle the weight of rail cars. "It's another example of our short sighted transportation policy," said Josh Tulkin, the state director of the Sierra Club Maryland chapter. "We need long-term investments in rail or we will be expanding freeways lane by lane well into the future." Weekend drivers will have to wait a few more weeks for the full benefit of the project, as there will be single-lane closures on two to three weekends for paving and striping of the Inner Loop local lanes tying in with the Route 1 Interchange.